Beautiful ribbon flower tutorials are just the best! They can be used to embellish all kinds for things, whether it’s in your hair, on a pillow, as a decorating item, even your favorite outfit can be made to look more trendy! We are always on the hunt for a good ribbon flower tutorial. There are so many creative ways to make a beautiful ribbon flower. Here is a dozen of some fabulous flowers! If you’re just getting started in the flower crafting art, this is perfect for you. The rolling satin flowers are a super easy DIY craft that will take you no time to make. Although simple, these are beautiful! This DIY ribbon rose is so simple and beautiful. The leaves are a great plus on this tutorial! Again, quick, easy, perfect! The melted technique will give you a very real looking flower! Just follow this simple steps and I no time you’ll have a beautiful and unique satin flower. 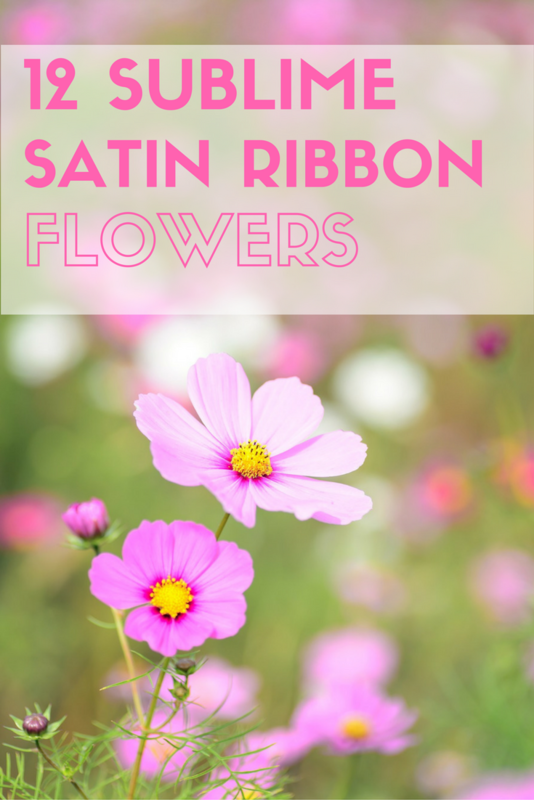 This quick and easy satin ribbon flower tutorial can make a perfect kids fashion accessory! Much simpler than they look like! Since we are talking about kids, this satin ribbon flower hair clip is the perfect complement for any little girl’s outfit! Super easy to make. These satin peonies are just as pretty as they are easy to make! You can easily turn them into any fashion accessory of your choice. This is one of the prettiest satins flowers we’ve seen! The first steps might take you some time, but it is still a very easy craft! Totally worth it. If you are not into buds, but more blossoming flowers, this is the one for you! This beautiful blooming rose made out of satin ribbon is just as beautiful as a real one! These sweet and beautiful daisies are the perfect way to add a touch of cuteness to anything you could think of! And plus, they are super easy and fun to make. Throw some rhinestones to give them some sparkle. Although very easy to make, it will definitely take you some time to do. But don’t be discourage by this! A bouquet of this beautiful dahlias will make an amazing decoration item! The process of this beautiful satin ribbon and pearls flower is very similar to the dahlias before. Just keep an eye on the petals! That’s what makes this flower so different and unique. And of course, don’t forget about those pearls! Again, the petal is the key! This is a little time consuming, but the results are totally worth it! The perfect budget decoration item for any dreamy wedding! Some are easier, some will take you more practice, but they all are oh so beautiful! Just pick your favorite satin ribbon from our store and make yourself a beautiful bouquet of satin ribbon flowers! I loved this! Which other ribbons could I use for these crafts? Certain content that appears on this site comes from Amazon Services LLC. This content is provided ‘AS IS’ and subject to change or removal at anytime. Drency is a TM of Canal IP Network S.L.